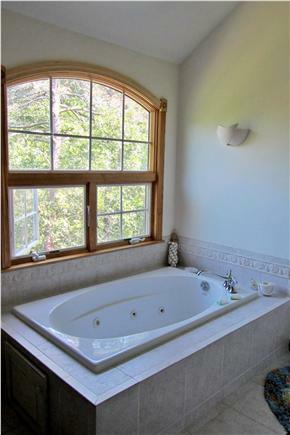 Beautiful contemporary on a private way, pine woods setting, only two homes on street. 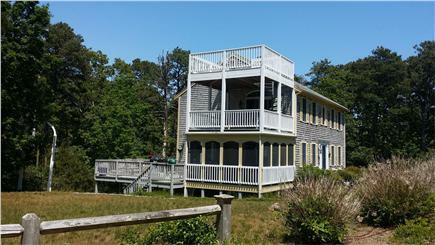 Located about three miles to Indian Neck Beach, or Mayo Beach. 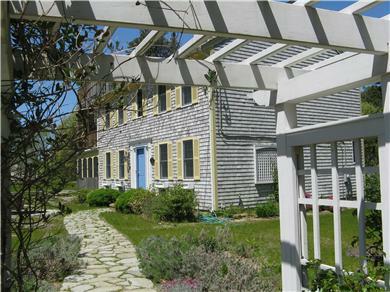 The home has a small peek at the Harbor, and is one street after Nahaunt Bluff. Close to everything, but a quiet location. You can enjoy the large back deck area for sunning, or the private deck off of the master bedroom. Dine on the screened porch off of the great room area. 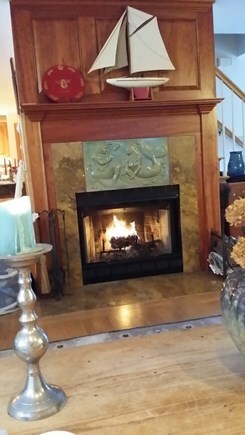 Enjoy reading a book in front of the ''mermaid'' fireplace on rainy days. On the main level an open plan living area permits dining at the long country tables, or view the bird feeders off the deck, or keep the cook company in the kitchen while relaxing in the living area. A half bath is off the separate TV room, which is next to the kitchen. The master bedroom has a queen sized canopy bed, a separate covered deck access, and a master bath with jacuzzi tub, and a separate shower and double sinks. The other upstairs bedroom has a separate bath/tub/shower and 4 twin beds. The ground level has a queen-sized bed and private shower and bathroom and its own private entrance-way. An outside shower is also located on the ground level. A large screen TV is located in the ground level bedroom. 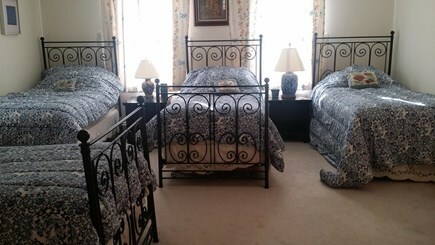 A daybed is also available in this bedroom. The first floor has a TV room with a daybed. Internet Access-but you must bring your laptop. Additional pricing info: There are no separate fees for cleaning., there is a discount for 31 day booking, State and local taxes of 12.45% will apply. We have stayed here multiple times and it's a perfect getaway spot! 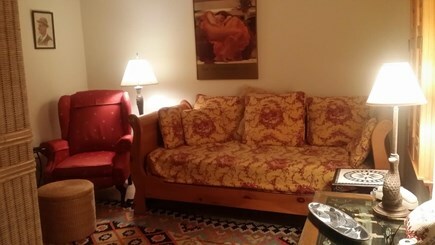 Spacious, comfortable, well-equipped, and close to the ponds and beach. Our family loves coming here and we recommend it wholeheartedly! 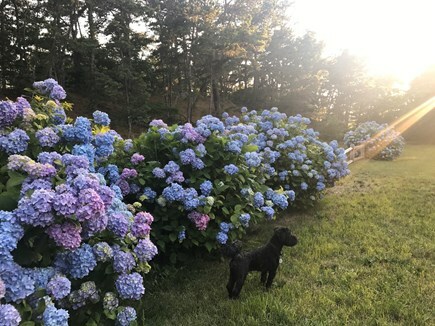 Stunning sunsets from the wrap-around deck, blooming plants inviting hummingbirds to feed, walking to Wellfleet's marina and downtown, and very easy access to bayside, oceanside, and family friendly ponds -- we couldn't have found a more perfect place for our vacation! 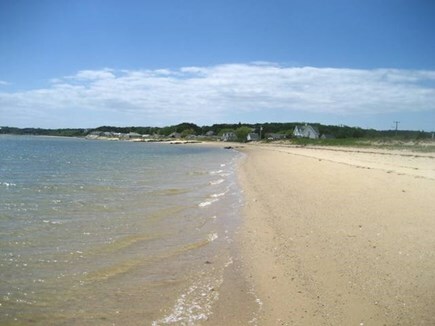 The location is midway between Orleans and Provincetown, so we were able to take advantage of National Seashore activities as well as fabulous shopping and dining in either direction. The decorating is top-notch and every room was beautiful and comfortable for all of us. We are pleased to hear that you had an enjoyable stay at our home. We have to say that the views are a bit blocked by foliage and another home. 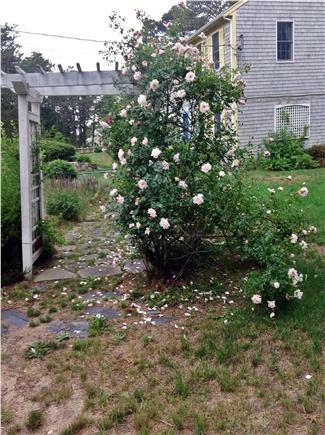 The distance to Wellfleet village is about a mile or more and should be accessed through Pine Point Way. We hope you do return! 'Loved the house, has a great open plan, well equipped kitchen (not what you usually find in a rental) which flows into the dining area and living room. The kids loved the big front yard to play - no street traffic, since it is one of two homes in this private area. Grown-ups loved the big back deck for cook-outs. 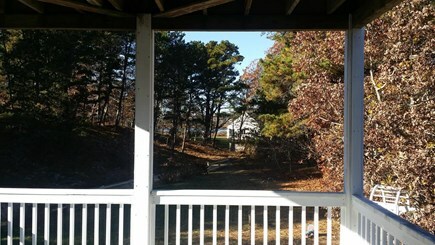 The home is close to Wellfleet village and its beaches - also just a short drive to Wellfleet ponds and lakes which were fun for the toddlers. "Really enjoyed the paddle boats and canoes one day at the pond. We will definitely be back ! We really enjoyed our stay at the Cape. This house fit our needs perfectly! The kitchen area flows into an open dining area making cooking in it fun and social. There is a large deck and a large great room with fireplace our whole family fully enjoyed. There is a screened porch with table and chairs for night time dining or for reading during the day. Because we had nice weather, we used the large deck (off of the great room extending across the back of the house) to do a lot of grilling over our stay. 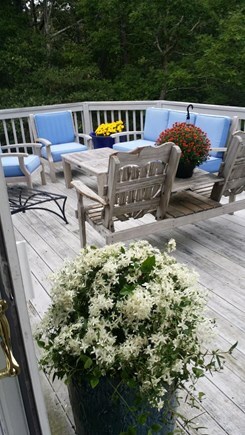 There is ample seating on the deck as well as a picnic table for family gatherings. It was quiet at night and the deck provided a nice place to sit to enjoy the surrounding pine woods and star gaze. The sleeping arrangements upstairs were, both, spacious and private. It consists of a large bedroom with 4 beds and a separate bath with tub and shower. There is, also, a master bedroom with sliding doors leading to a walk out porch. The decorations in both of the bedrooms were casual and comfortable. 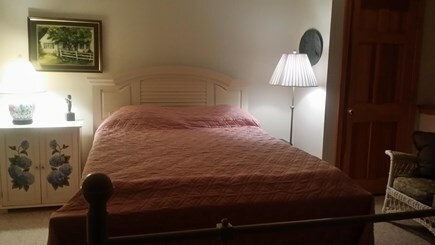 The downstairs includes a large carpeted, finished room with a queen size bed. The room is separated by a day bed. It includes a couch and a large screen TV. This room is perfect for children or teenagers to play or watch television. There is a private bathroom with shower located in the downstairs as well. The location is really nice. A long, 20 mile bike trail is close by. 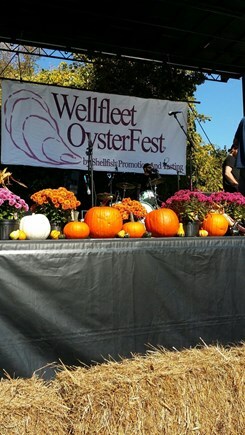 We discovered the beginning of the trail is actually in Wellfleet. We were very glad we brought our bikes! The bayside beaches are close by (Indian Neck, Mayo). The ocean beaches are a short drive. This secluded, beautifully decorated home, with every kitchen amenity and cool breezes and multiple decks should be on everyone's short list if you need a spacious rental home. The house is off Route 6 on a very long private road with just one other house. Short drive to town. You can glimpse a house on the hill opposite and at the end of the road you may see the bay filtered through trees. The large comfy living room has multiple arm chairs and couches for different projects, games or reading-- and soft nautical oil paintings. Three identical rugs connect that with the dining room, and the kitchen is open to let cooks enjoy the company. There is a huge wrap-around deck, again, lots of chairs with pretty cushions to accommodate everyone and still have space for kids to play, grills to cook on. For the night time, when Cape mosquitoes appear, there is a spacious screened in porch, a necessity in summer. The master bedroom has a Queen bed, pillowtop mattress, very comfortable and lovely furniture--a 4-poster bed, an elegant tiger maple dressing table, chest, chairs and lots of space for luggage and personal items. Tiny details reveal any extraordinary eye--alabaster lamps, an art deco lamp. The second bedroom, with the four twin beds also has beautiful objects and furnishings, far beyond what you see elsewhere in what might be called the "dormitory room." Oh, it is a really pretty room. On the first floor TV room, there are also lovely pieces picked up probably from travels around the world. 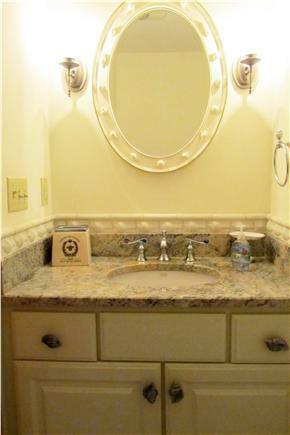 All the bathrooms are modern, with marble countertops, lots of space and the main floor powder room is especially attractive. The third bedroom is very large, though in the basement, and as the exterminators had just visited, it had a chemical smell, especially from the adjoining laundry room, accessed from that bedroom. It is probably not a problem when the humidity is low, but not a place to put a guest family or your parents in. However, teens would love the big TV and the multiple day beds and couches, plus the queen bed and all that space. A Fabulous Vacation Home in Every Way!